Scribes, Minstrels and Storytellers were the ‘keepers of the history’, going back as far as ancient Egypt and even beyond. The stories of tribes and communities were painted on cave walls, sculpted in stone, or painstakingly illustrated on animal skin or parchment. Stories were passed from generation to generation, some gathered in circles around blazing fires, many told from father to son and from mother to daughter. The culture and the history were preserved, and tales of bravery and acts of courage were interspersed with accounts of the daily lives of the ancestors. 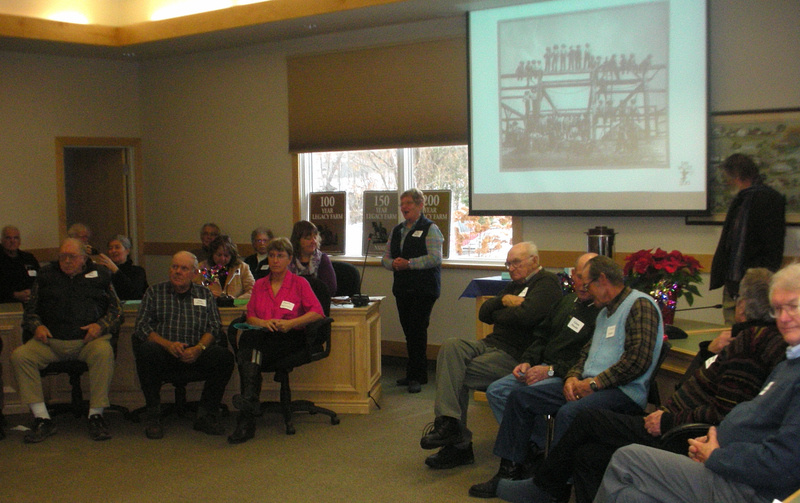 As preparations for the 200th anniversary of Tay Valley Township gain momentum, the group producing the book ‘At Home in Tay Valley’ gathered together all of the contributors this past Saturday November 22nd 2014 at the Tay Valley Township office on Harper Road. Some of the those present had written chapters for the book, and some had been interviewed, and their oral accounts had been recorded and transcribed for posterity. 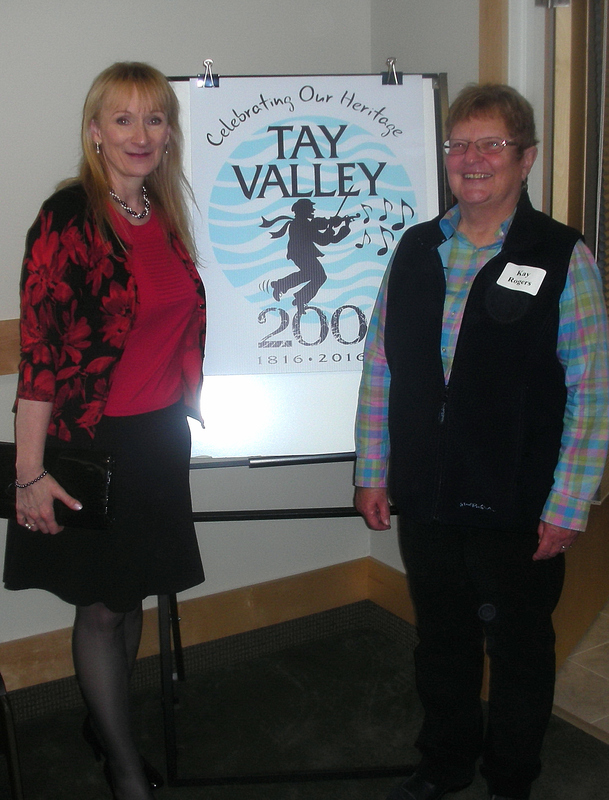 Regardless of the nature of their contributions, everyone present understood the importance of documenting the history of Tay Valley, and preserving it for future generations. 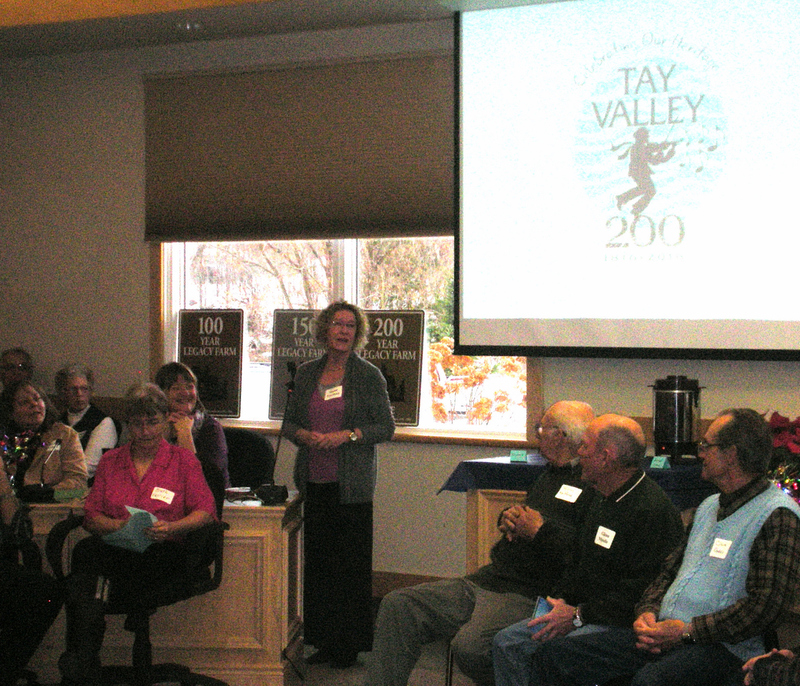 Deputy Reeve of Tay Valley Township Susan Freeman welcomed all of the contributors to the gathering, and spoke briefly about the 200th anniversary and some of the events that would be held as part of the celebration in 2016. Kay Rogers, the Editor of ‘At Home in Tay Valley’ read the names of all of the contributors to the book, and gathered everyone together for a group photo that will appear in the book. As Kay said, no gathering in Tay Valley would be complete without some tasty treats, and everyone had the opportunity to mix and mingle while enjoying coffee, hot apple cider and a delightful assortment of cookies and squares. We chatted with many former neighbours and long-time friends from Calvin United Church – Maxine and Keith Jordan, Alan Jordan, and former 4-H Club fellow member Ruth Miller-Baker. We were especially delighted to have a chance to visit with another dear friend Betty Miller who lit up the room with her ever-present smile and unstoppable cheerful spirit. Another old friend Keith Kerr stopped by to say hello, and it was nice to see many other friendly faces from Tay Valley, particularly those from the former Bathurst Township. We look forward to the publishing of the book with great anticipation, and are thankful that these stories and memories will be preserved in this unique collection. The books are scheduled for printing late in 2015 and forms for pre-ordering are available now. To pre-order your copy, please contact Kristine Swaren at 613-267-5353 ext 129 or email your request to: planning assistant (at)tayvalleytwp.ca. Some dear neighbours and friends from Calvin Church – far left Betty Miller, 4th from the left Alan Jordan, Keith Jordan, Maxine Jordan and former 4H member Ruth Miller-Baker. This entry was posted in Historical Interest and tagged 200th Anniversary Tay Valley Township, Alan Jordan, Arlene Stafford-Wilson, At Home in Tay Valley, Betty Miller, Books Bathurst Township, Books Tay Valley Township, Harper Road Perth Ontario, History Bathurst Township, History Tay Valley Township, Keith Jordan, lanark county history, Maxine Jordan, Perth Ontario history, Ruth Miller-Baker, Tay Valley Township office.